– “The Delos Underwater Survey Project (2014-2016)“. The Honor Frost Foundation Conference Under the Mediterranean, Nicosia, Cyprus, October 21, 2017. – “Δῆλος ἄδηλος? Delos after the late Hellenistic period”. St Andrews/University of Zurich Conference Landscapes of Movement: Religious space and topography of the Cyclades, 8 th century BCE to 8 th century CE. School of Classics, St Andrews, May 25 – 27 2017. – “Merchant associations and domestic cults as economic agents in Late Hellenistic Delos”. Annual Meeting of the Society of Classical Studies, Epigraphic Economies Panel. Toronto, January 8, 2017. – “The Delos Underwater Survey Project (2014-2016)”. Annual Meeting of the Archaeological Institute of America, Session 1G: Maritime Archaeology. Presentation with the scientific co-director of the underwater fieldwork project, Magdalini Athanasoula. Toronto, January 6, 2017. – “Merchant associations, domestic cults and architecture in late Hellenistic Delos”. The Circle: Dialogues on Greek and Roman Architecture, German Archaeological Institute at Athens. Athens, December 19, 2016. – “Interdisciplinary Methodological Approaches to the Study of Classical Urbanism between the Fields of Archaeology and Architecture”. International Conference New Approaches and Paradigms in the Study of Greek Architecture, Session IV: Social Dimensions of the Built Environment. Athens, American School of Classical Studies at Athens, November 5, 2016. – “Υποθαλάσσια έρευνα στη Δήλο και Ρήνεια (2014-2016, Ε.Ε.Α. & Ε.Ι.Ε. ): Τα βοηθητικά λιμάνια της υστεροελληνιστικής Δήλου” [“Underwater research at Delos and Rheneia (2014-2016, EUA & NHRF): The auxiliary harbours of Late Hellenistic Delos”. Conference of the Ephorate of Underwater Antiquities. The Acropolis Museum, October 14, 2016. – “The port-city of Delos and its commercial cityscape”. 117th Annual Meeting of the Archaeological Institute of America, Session 3J. San Francisco, January 7, 2016. 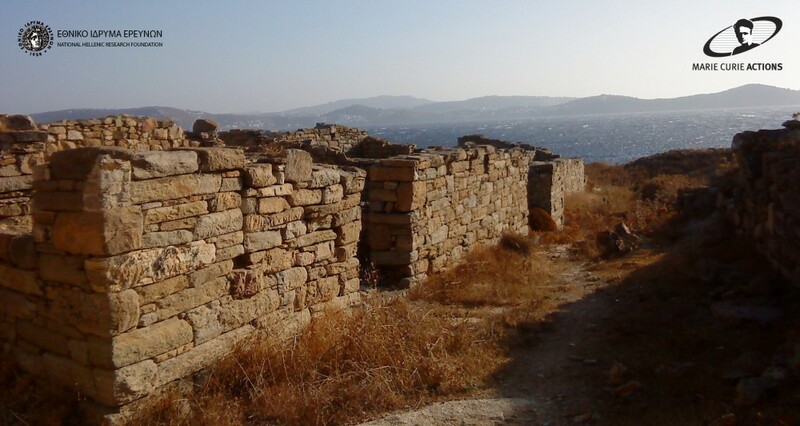 – “The port-city of Delos and its commercial cityscape”. PortusLimen Seminar, University of Southampton. Southampton, November 10, 2015. – “The ports of Delos”. Oxford Greek Archaeology Group. Oxford, April 30, 2015. – Poster presentation of the underwater archaeological investigation of the northeast side of Delos (Stadion District) at the 2nd Athens Science Festival. Technopolis City of Athens, Athens, March 17-22, 2015. For more information, press here. – “Υποβρύχια αρχαιολογική έρευνα στη βορειοανατολική πλευρά της Δήλου (Συνοικία του Σταδίου)” [Underwater archaeological investigation of the northeast side of Delos (Stadion District)]. Presentation with the scientific co-director of the underwater fieldwork project, Magdalini Athanasoula. «Βουτιά στα περασμένα: Η υποβρύχια αρχαιολογική έρευνα, 1976-2014» [Diving in the past: The underwater archaeological research, 1976-2014]. Conference of the Ephorate of Underwater Antiquities. The Acropolis Museum, Athens, March 6, 2015. – “UrbaNetworks: die Hafenstadt Delos und ihre sozialen und wirtschaftlichen Netzwerke”. AIGEIROS lecture series, German Archaeological Institute at Athens. Athens, February 25, 2015. – “Ματιές στην πόλη: μία πρώτη σύνθεση” [Gazes of the city: a first synthesis]. Presented in the lecture series Gazes of the city: between architectural and archaeological approaches. National Hellenic Research Foundation. Athens, December 18, 2014. – “The Italian houses of late Hellenistic Delos: Blurring the boundaries between public and private”. Public and Private in the Roman House and Society. Institutum Romanum Finlandiae, Rome. November 7-8, 2014. – “Γκράφιτι και επιγραφές στο ιδιωτικό οικιστικό περιβάλλον της Δήλου” [Graffiti and inscriptions in the private domestic spaces of Delos]. Seminar of the Section of Greek and Roman Antiquity. National Hellenic Research Foundation. Athens, October 14, 2014. – “Urban networks: the port-city development of Delos”. Paper presented in the session A Matrix of Socioeconomic Connectivity: Ports, Harbors and Anchorages in the Mediterranean. 20th Annual Meeting of the European Association of Archaeologists (EAA). Istanbul, September 10-14, 2014. – “The urban development of late Hellenistic Delos”. Roundtable Discussion Revolutionizing Familiar Terrain: The Cutting Edge of Research in Classical Architecture and Town-Planning, Third International Meeting of the European Architectural History Network (EAHN). Turin, June 19-21, 2014. – “La mobilité sociale à Délos: quelques remarques à partir de la culture matérielle et des documents épigraphiques”. Conference Dynamiques sociales dans la péninsule hellénique sous l’empire: mobilité et changement statutaire. Institute of Greek and Roman Antiquity of the National Hellenic Research Foundation and the French School of Athens. Athens, May 27, 2014. – “The city of late Hellenistic Delos.” Workshop Greek Building Programs, Finnish Institute at Athens. Athens, May 23-24, 2014. – “The dynamic commercial cityscape of late Hellenistic Delos”. Classical Association Annual Conference 2014. Nottingham, UK, April 13-16, 2014. – “Η εξέλιξη του εμπορικού τοπίου της υστεροελληνιστικής πόλης της Δήλου” [The development of the commercial cityscape of the late Hellenistic city of Delos]. National Technical University of Athens, Department of Architecture, Section of History of Architecture. Athens, March 27, 2014. – “Les maisons des Romains installés à Délos”. Workshop Les élites négociantes de l’Empire romain. Université de Poitiers, Poitiers, October 10, 2013. -“The city of late Hellenistic Delos and the integration of economic activities in the domestic sphere”. Harvard University, The Center for Hellenic Studies. Washington, DC, April 26, 2013.